You can fly directly into the Orlando International Airport (MCO) (http://www.orlandoairports.net/) from many US and international cities. The Orlando Airport is approximately 50 miles from our meeting hotel, the Cocoa Beach Courtyard Marriott. The hotel does not provide shuttle service and a taxi will cost approximately $75 one-way. The Cocoa Beach Courtyard address is: 3435 N. Atlantic Ave., Cocoa Beach, FL 32931. From the Orlando Airport, take State Road 58 (Beachline Expressway) east for 45 miles to Cocoa Beach. The hotel is on the left approximately one half mile south of Ron Jon’s Surf Shop. Parking at the Cocoa Beach Courtyard is complimentary for their guests. 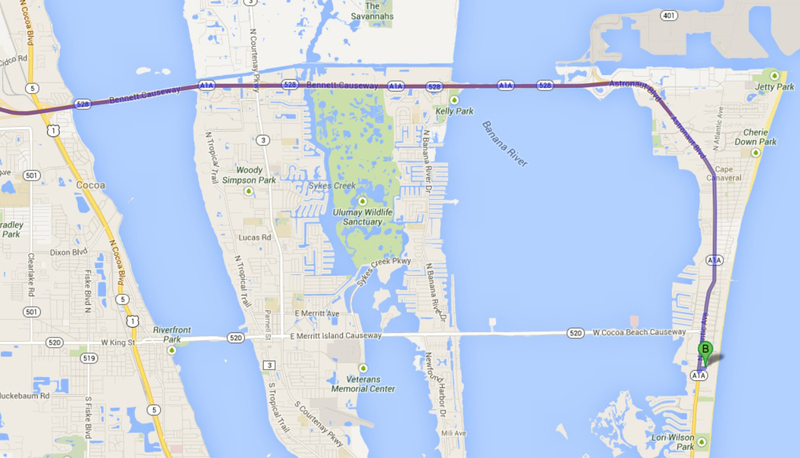 The maps show getting to Cocoa Beach from the Orlando Airport and the Cocoa Beach area. ick image to view full size. If you prefer to NOT rent a car, you can contact TraveLynx for a shuttle ride. Contact: 1-800-226-5969, 1-321-631-7777. The one-way price per person is $35-$40 if you travel between 7 am and 7 pm. Please make your reservations 48 hours in advance. You will be asked to pay in full at the time of your reservation. Perhaps just get a 1-way ticket, and then at the SORCE Meeting you might be able to hook up with someone for a ride back to Orlando. If no one is on your schedule, you can then contact TraveLynx for a ride back. Tucked away amidst the tree-lined avenues of a nostalgic riverside community, historic Cocoa Village is a charming cornucopia of unique shops and some of Florida’s best gourmet restaurants. Historic buildings have been renovated and now hold a multitude of antique shops, art galleries, boutiques, and specialty stores.